As far as I know, Larry has recommended that investors who hold CCFs should also consider extending duration of safe bonds, and this has been a consistent recommendation. In the article linked from Yahoo Finance, he gives Vanguard Short-Term Treasury ETF (VGSH) and Vanguard Intermediate-Term Treasury ETF (VGIT) as examples. They have durations of 1.9 and 5.2 years. I'll use Vanguard Short-Term Treasury Fund Admiral Shares (VFIRX) and Vanguard Intermediate-Term Treasury Fund Admiral Shares (VFIUX) because they have longer histories. They have durations of 2.3 and 5.3 years. Larry also recommends 5-10% of the equity allocation goes towards a commodities fund. I will compare a 60/40 portfolio to 55/40/5. I personally prefer market cap weightings for domestic/international so I will use 50/50. The obvious result here is that CCFs made little difference to the portfolio. It slightly reduced return while reducing volatility. Extending duration paid off a lot. Larry apparently included an argument for CCFs in the 2005 edition of one of his books. Starting the comparison in 2006 makes Portfolio 1 better than Portfolio 2, but Portfolio 3 is still best. People who took the advice had it pay off. Personally, I have no interest in CCFs because I have access to the G Fund and do not want to extend the duration of my fixed income. I'm not saying that you are wrong, but as someone who views the purpose of fixed income differently, I would still use this, extend my fixed income duration, and if I wanted to take risk off of the table, then put some money in the G Fund. Since the G Fund and (some) stable value funds act like high yield cash, it may make sense to use it with a fixed income barbell strategy. If the best expectation [for commodities] is matching inflation, why not just own TIPS? • For stock-heavy portfolios: Though stocks perform best during low inflation, they can likely be expected to generate real returns of at least 3%-4% over the long haul — which in itself can absorb and overcome any short-term bursts or temporary spikes of high inflation. • For balanced portfolios: On the stock side, one can tilt toward REITs, value stocks or emerging market stocks (which have historically been strongly correlated with commodities). On the bond side, one can tilt toward TIPS. • For bond-heavy portfolios: A substantial allocation to TIPS is likely the best inflation insurance. Personally over the years, I've become less concerned about the threat of prolonged high inflation. Central banks around the world are much more focused on inflation targeting now. The world's population will be aging rapidly in the decades ahead, and long-term global economic growth appears to be trending lower and slower. That said, because the consequences of high inflation are so severe for any investor in financial assets, it's only prudent to take the threat seriously and to construct portfolios with inflation insurance in mind, I believe. If the best expectation is matching inflation, why not just own TIPS? Commodities have expected returns of approximately the level of inflation (ie short term bonds) but their higher volatility and relatively low correlation with both stocks and bonds can be used to improve portfolio diversification and/or risk-adjusted returns. Personally over the years, I've become less concerned about the threat of prolonged high inflation. Central banks around the world are much more focused on inflation targeting now. Oh, we've had prolonged high inflation. Just not where we usually look for it. One of the frequent criticisms against QE is that the liquidity that was created remained largely within the banking system... Hence, asset prices such as stocks, bonds and real estate rose, but broader measures of price and wage inflation lagged. Yep, and given planned QT (and inflating away national debt likely), commodities seem an especially good hedge. Another criticism of QE is that it led to inefficient capital allocation and mal-investment in the commodity space, among other sectors, which was deflationary. No, we haven't. That's just not an accurate way of expressing it. What you mean is that you believe that there there is stored up tension within the financial system that must inevitably be released as inflation, sooner or later. Maybe so, maybe not, but in any case, that is not inflation. It is a basis for a prediction that there will be inflation. No, I believe QE and ZIRP led to TINA which inflated asset prices. I predict asset prices will deflate with QT and interest rate normalization. I have considered doing this by combining the G Fund with something like Vanguard Long-Term Treasury ETF (VGLT) or Vanguard Extended Duration Treasury ETF (EDV). 15% of my portfolio is fixed income. Moving 5% to either VGLT or EDV would make my fixed income duration 5-8 years with little increase in expected returns. Then I would have to move another 5% to a commodities fund. This would have to be in my IRAs, which are only 36% of my tax-adjusted portfolio, will likely be a smaller percentage as time goes on, and are fully tilted already in AQR funds. I'm not a big believer in volatility for the sake of volatility, and with the reduced tilts, I don't think its worth it. It may also be that commodities are cheaper because they mostly come from very underdeveloped countries whose currency hasn't kept up with the dollar/Pound?Euro. The population of the world is irrelevant since so much of that population lives in abject poverty. Whatever you believe is going on in the background, we have not had "prolonged high inflation." We haven't had high inflation since Volcker. There hasn't been a hint of high inflation in the last twenty years. Last edited by nisiprius on Fri Apr 12, 2019 6:48 pm, edited 1 time in total. I'm not sure what you mean by "asset prices" here. The only "asset prices" that count in measuring inflation are the prices of the items in the BLS market basket that's used to calculate the consumer price index. Whatever you believe is going on in the background, we have not had "prolonged high inflation." We haven't had high inflation since Volcker. There hasn't been a hint of inflation in the last twenty years. There’s an adjective missing in the last quoted sentence, I think. We have inflation of some sort every year: high, low, or negative. I understand. I'm in a similar situation myself. Since I'm active duty military, I'm focusing on my Roth IRA contributions first, then TSP and finally taxable for additional investments. I'm also considering rollovers once I retire. The 10 year return of LTPZ (long term TIPS) has lagged EDV (ultra long Treasuries) by something like 4% per year. The question for those devoting a sizable portion of their portfolios to inflation-fighting assets is: can you stomach this level of opportunity cost for the next 10 to 15 years? I think of it instead as a contrarian signal ("The Death of Equities") that inflation is anon. To answer your question: yes, in the same way I stomach the opportunity cost of insurance on my condo, cars, motorcycles, and boat. Plenty of folks decline to buy insurance because it’s too expensive relative to the likelihood and scope of loss. With this latest evidence, I consider inflation protection to be too expensive. Will this fund generate a K1? Does it have any tax advantages/disadvantages? Sure (proportionality seems absent in the hyperinflation thread), but 5% seems inexpensive. As to "evidence," I'm unconvinced (I do actually lean to Japanification, but I'll diversify my hedges). While I have no interest in a commodities fund and own neither long term TIPS nor long term treasuries, is it even possible for there to be anything like a 4% per year difference in return for the next 10-15 years, given a starting point of less than 3% yield on treasuries? In 2009 the yields on Treasuries were 3% as well. It’s 4% of your assets per year, 40% of your return over 10 years. Yes I think it's a good thing too, and I think that anyone who happens to still be following Larry Swedroe's advice from some 10 years ago will likely be pleased as well. What? Ten years ago Larry was recommending CCFs, lots of small value, short term treasuries etc. None of that has done particularly well in the last decade. johnnymack wrote: Would this ETF be considered a CCF? That is a CCF fund. A collateralized commodity futures contract is one single futures contract of any commodity that is collateralized by T-bills (the assumption when futures are priced). A CCF fund puts several of these contracts into a mutual fund. CCFs are not commodities. They are derivatives based on the expected future price of commodities. There may be many, many more futures contracts on oil or gold created than there is actual spot oil traded. Most contracts are closed out long before expiration. In the long-term (over 20 years), the expected return of CCFs is the same as the spot price itself. However, since CCFs are not commodities, various factors influence price. Those factors include interest rates (the collateral cost), storage expenses, insurance costs, etc. As such, CCF prices they can act very different than spot commodities they are supposed to track. For example, in 2006, the price of spot oil moved higher while the price of oil futures trended down. Historically, commodities are a very uninteresting asset class. Commodities are not stocks and bonds. They are not a 'going concern' and earn no interest or dividends when held. Investors rely 100% on changes in price. 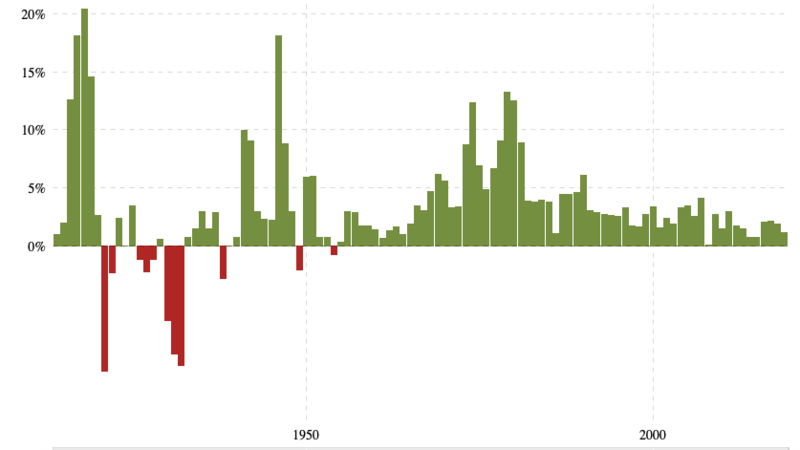 Historically, every 25 years or so the world experience extremely volatile price spikes in commodities that last on average 5 years (1976-81, 2003-07), then there is gradual decline in prices for the next 20 or so years. A recession in the US has typically capped those spikes. I realize that many people are eager to put money into this latest spike. However, before committing capital to this hot asset class, consider that fact that energy stocks and other natural resource stocks are more than 15% of the global stock market, and that YOU HAVE earned excess returns from the rise in commodities prices. Don't overdo commodity exposure with high cost CCF funds. Especially at this point in the economic cycle. Also see the follow-up posts in that thread, as Larry Swedroe disagrees with the above. Let's say expected return of EDV, based on that yield would've been ~3.8%, those rates have declined by a net of about 1%. Duration of EDV is about 24 years, so 1% rate change should change price by about 24%. Over 10 years that 24% would be about 2.4% per year. The expected 3.8% plus the 2.4% due to price change, would give a total of 6.2% and the actual 10 year return is 6.29%. So nearly 40% of the return over the past 10 years was due to the net decline in applicable interest rates. LTPZ does not have a 10 year record yet. But, perhaps interestingly, it's return over it's lifetime is not much different from Vanguard Long-Term Treasury (VUSUX). Does this mean that EDV's higher return is more due to it's longer duration, rather than a nominal vs. TIPS difference? With start date set based on LTPZ, the M* growth of $10,000 has LTPZ at $16,076 and VUSUX at $16,583. Meanwhile EDV is at $19,633. That does not appear to amount to a 4% difference in return. Using 9.5 years, I get a difference of about 2.3%, annualized over that period. How did you come up with your 4% per year difference? Are you implying that it’s unlikely we will see a 1% decline in long term yields over the next 10 years? Given the trend line of interest rates over the past 30 years, I’d say it’s more likely than not. Duration of LTPZ is 22 years. Duration of EDV is 24 years. My math was bad there, you’re right. Ten years ago Larry was recommending CCFs, lots of small value, short term treasuries etc. None of that has done particularly well in the last decade. You believe the next decade will look like the last? I have no idea. But I find the case for CCFs rather weak in particular. CCF funds can be viewed as insurance. If one views it in this perspective, then the slightly negative returns and slightly higher volatility compared to intermediate term treasuries is justifiable. 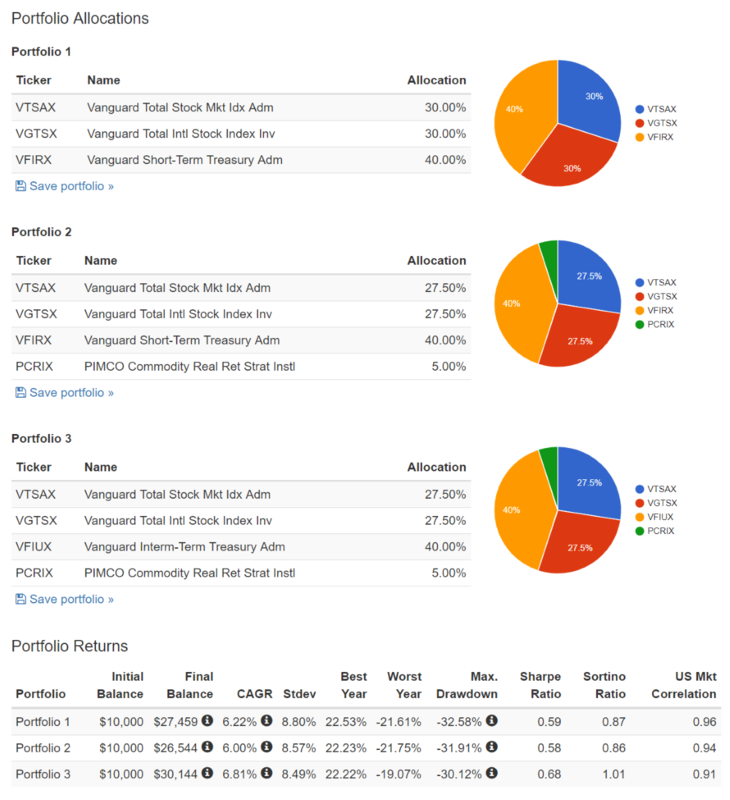 For a portfolio using VT as the only equity allocation and a fixed income portfolio balanced in term risk using US government bonds, you are giving up a little bit of returns and experiencing slightly higher volatility and maximum drawdown for insurance against inflation. It'll be a first day purchase for me, barring Swedroe's take. Larry was kind enough to answer a couple questions. Q. Have you shared your thoughts on Vanguard’s new Commodity Strategy fund yet? I’m curious if you’d recommend it as a “next best” alternative choice for those of us unwilling to pay for access to the other alternatives (alternative lending, reinsurance, etc.). Larry. Have not looked at it. First, the nature of the commodities market has changed due to financialization. Historically there had been a balance between contango and backwardation, moving back and forth in energy, with slight average of more backwardation. My assumption was it would average zero. With financialization it became mostly persistently contango. I did not expect that because if that happened would lead to poor returns and investors existing, and thus restoring the balance. But when that did not occur I sold my commodities positions, reason simple, VALUATIONS matter, just like with stocks. Should not be ignored. Second, we now have IMO better diversifiers which have PREMIUMS, reinsurance, VRP, AQR style/risk premium and alternative lending. And because commodities are tax inefficient, they crowd out these others. So IMO not needed. Vanguard entering space is clearly good since ER lower, but key is execution and cannot be pure indexer or trading costs and implementation costs will kill you, have to trade around the roll dates for example. And IMO should consider contango and backwardation. Q. But since we’ve suffered the poor returns, isn’t the valuation pretty attractive now? Good responses in this thread. Changed my mind, this commodity CCF will not be in my portfolio despite having Vanguard name. I had forgotten that it is based on derivatives, and that in my amateur opinion derivatives have been one of great inventions by banks in loans using rate protection and fund companies in funds to effect a major transfer of wealth from borrowers and investors to banks and investment companies. I’ll stick with the plain vanilla Vanguard funds. Good luck. I’ll stick with the plain vanilla Vanguard funds. Good luck. Perhaps someday Vanguard will also. Do you imagine anyone interested today is interested because it is a hot trend, Rick? No chance given that they've never offered just just plain vanilla funds (which I read to mean index funds). If anything, they've only expanded since the beginning on that front. We (or at least most of us) love them because they're low cost... not cause they're index/vanilla only. This is yet another low cost offering. The hottest trend of all, by a long shot, is passive, low cost investing. There's not even a close second to the indexing trend. Given that, I'm going to disagree with Rick on this one. Seriously - I'm reminded of the cocktail party analogy W. Bernstein used in a couple of his books. If you wanted to be admired at one of those parties today, just say you're rocking a Warren Buffett 90/10 portfolio (90% S&P 500, 10% cash). Or better yet, say cash is trash, and say it's 100% S&P 500. If they doubt you, be ready to quote your 10-yr return on that (even though you know you bought it a few months ago). The present value of any investment is the discounted value of its future cash flows. #1. For bonds, it's interest income plus the par value of the bond at maturity. #2. For stocks, its dividends plus the prospect for real growth from future economic activity. #3. For commodities, it's the price of the commodity. No interest, no dividends, no growth. A pile of bricks today is a pile of bricks tomorrow. Would I take money from investment #1 or investment #2 to buy product #3? No. Only if I needed a pile of bricks.